How much is Pat Dye Worth? Pat Dye net worth: Pat Dye is an American football player, coach, and college athletics administrator who has a net worth of $10 million. 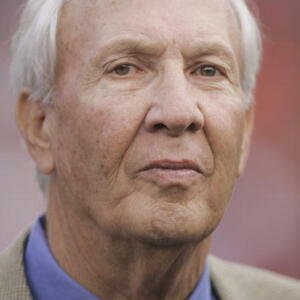 Pat Dye was born in Blythe, Georgia in November 1939. As a player he was an All-American at Georgia as a defensive guard and linebacker. Dye played for the Edmonton Eskimos of the Canadian Football League from 1961 to 1962. He became the linebackers coach at Alabama from 1965 to 1973 and then served as head coach at East Carolina from 1974 to 1979. Dye coached Wyoming in 1980. He was the head coach at Auburn from 1981 to 1992 and also served as athletic director for Auburn from 1981 to 1991. He is a three time SEC Coach of the Year and won the Southern Conference championship in 1976 and has won four SEC championships. Dye was inducted into the College Football Hall of Fame in 2005. He has also worked in broadcasting and authored the books In The Arena, War Eagle!, and After The Arena.